How can foreign companies market their products in China? How to establish and hone a reputation? One key to achieving this is to understand China’s media system. 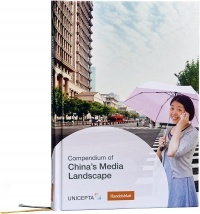 The "Compendium of China’s Media Landscape" by media intelligence provider UNICEPTA offers the first real insights into how the Chinese stay informed and up-to-date, what the main online, social and print media are - and what basic rules Western companies should consider in their communication.